Atlanta, MI hunting guide John Jones (left) prefers to use a Woodhaven conditioning stone to “sweeten up” his (Rod Benson Calls) Cherry Poppin’ slate call. Time flies when you are having a good time because it sure doesn’t seem like I’ve been hunting springtime wild turkeys in Michigan for over 45 years. In the early days this all took place “up north” and there was a chancy lottery that had to be dealt with, and you could only hunt in the morning. I was quite fortunate on the draw for a spring turkey license (I always opted for the seasons that offered the best odds for getting drawn) and I was elated when the hunting hours were eventually extended to include the afternoon. If you were a keen observer while scouting during the down time back in the early days, great opportunities were possible as the day progressed. What really made me happy was when wild turkeys were successfully planted in the Thumb during the mid- 1980’s, and having spring turkey hunting seasons in our area since the early 1990’s. There is something to be said about being able to hunt closer to home and it sure doesn’t hurt the local economy any either. I’ve run into turkey hunters in the Thumb who were from other parts of the state. The fact is, the Thumb offers excellent wild turkey hunting opportunities today, and that certainly works for me. 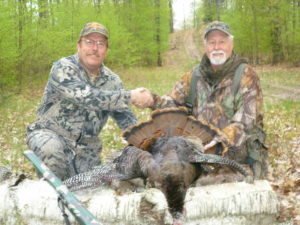 Gary Morgan in a joint effort with John Jones – a Tom Lounsbury gobbler! While there is still a lottery-type system to get drawn for early seasons and on public land in the Thumb, I truly appreciate the regular, late season hunt (234) on private land that can now be bought over the counter (I’m old school and still get all of my hunting/fishing licenses over the counter). 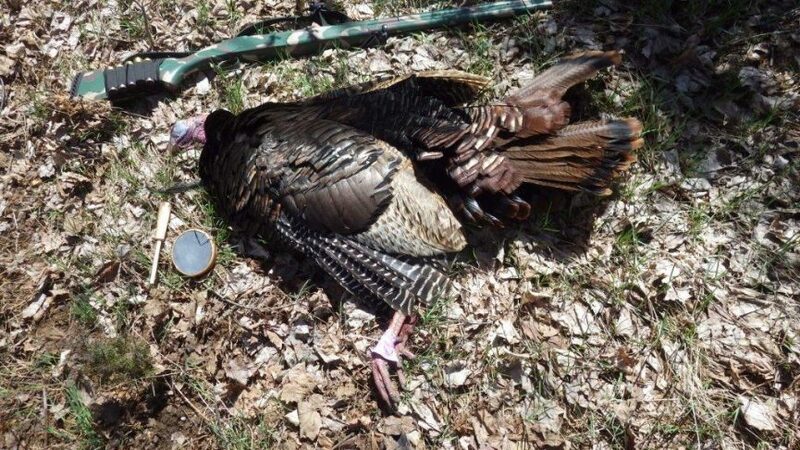 This hunt allows most of the month of May and can also be used even up north (refer to the Michigan wild turkey hunting guide). Because it allows more time for turkey hunting, I’ve grown to love the late season, because I can literally pick and choose the days I go afield. Spring is usually taking a strong foothold during this May timeframe and it is absolutely a great period to be in the woods just greening up. Sights, smells, new migratory songbirds showing up, you name it. Spring has truly sprung, and what a great way to truly enjoy it! If you have never tried spring turkey hunting here in Michigan, you should, because you are missing out on one of the finer points of life. You might even find some morels and wild leeks during the process. 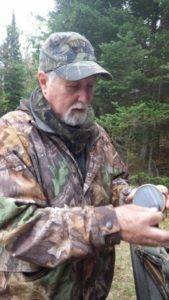 The long used technique for hunting springtime wild turkeys is to be in the woods by first light and use a “shocker” call, usually crow or owl, to locate a roosted flock, and figure what to do and where to set up from there, and first light is an amazing time to be in the woods. It is a pretty good system for the earlier seasons, but turkeys usually get a change of attitude by the time the late season in May arrives. Some of it has to do with previous hunting pressure of course, but a lot has to do with the ongoing mating cycle. In May, gobblers tend to be “henned-up”, meaning they will usually go with the flock of hens going out to early morning feeding spots. No matter how much they respond to calling efforts, I’ve found gobblers tend to stick with the feeding hen flock to do all the dating they can with any receptive hens which are fully in sight. By mid-morning the dating ritual has subsided and that is when gobblers tend to respond more readily to calling efforts, at least that has been my experience. My favorite timeframe for late season turkeys is from 10 am until 2 pm, with most of my kills taking place closer to noon. Due to other matters, I didn’t get out for the Monday opening day, but Tuesday morning found me set up by 10 am in a friend’s log deer blind tucked into a hillside that overlooks an open bowl in the surrounding woods. It reminds me of a “bunker” if you will, with a gun slit and all, and is quite strategically placed. The key was getting to it without spooking any possible turkeys lurking about in the shadows. I use a hen decoy I’ve named “Norma Jean” that has been with me many seasons and does a great job of acting like a “bombshell” with the gobblers and also makes hens very jealous. The fact is Norma Jean has been slapped around enough by territorial hens that she is a bit disheveled and I’ve had to touch her up a bit with shoe polish to cover up the scrapes and scratches, but she keeps on ticking. I like to place Norma Jean a known 15 yards from my calling position, and this gives me a pretty good reference for gauging range. I use a “30 yard rule” and only shoot at gobblers very close to or inside that range, and my longest kill to date is 32 yards. I like to remove all the ”ifs” out of the shooting equation because wounded turkeys can be next to impossible to track down and recover. I dearly love to use friction calls with my favorite being slate calls (Wes O’Dell of Mayville makes a real dandy). Atlanta, MI hunting guide John Jones had recently sent me a “Cherry Poppin Slate” made by Thrill Chasers, LLC and Rod Benson Game calls in White Cloud, MI. Along with the call was a Woodhaven conditioning stone that sweetened up a slate much better and quicker than using sandpaper. John Jones had used this call to sweet talk a gobbler in for me last spring and its tune and tone impressed the daylights out of me and I had to have one. So this was the call I used on Tuesday as I tend to prefer to keep matters simple when it comes to “talking turkey”. When I first yelped out a gobbler responded right away, and it would be the only “gobble” I would hear that morning because late season gobblers tend to come in silent. Right after the gobble response I heard an annoyed turkey hen making “poink” sounds as she came down the hill to confront Norma Jean. This began with the hen fanning her tail and fluffing all up to make her appear bigger as she held her wings out and pointed toward the ground while she did the “chicken dance” around Norma Jean (I call it the chicken dance because it is near identical to what male prairie chickens do during their mating ritual, but in the case of turkey hens it is meant to be aggressive and intimidating). Of course Norma Jean wasn’t impressed any and just simply stared without even blinking, which annoyed the hen even more. It was while the hen was doing her second circle around that a gust of wind hit Norma Jean which forced her to do a sudden turn facing the hen who upon assuming an attack was in progress was squawking and side-stepping away. The annoyed hen suddenly slicked off and walked to my left and that is when I realized a nice gobbler had just shuffled into the scene. There is nothing that can match the striking pose of a wild gobbler in full strut with fanned tail, iridescent feathers flickering in the sunlight, highlighted by a snow white skullcap, powder blue cheeks and scarlet red throat. Yep folks, my pulse rate picked right up then. The jealous turkey hen however had her own ideas about this situation and strode by the strutting gobbler, which was missing its center tail feathers that left a noticeable gap in his fan, and began leading him away up the hill. Although the gobbler was close to the 30 yard mark, his body profile didn’t offer a proper shot. To compound matters 3 jakes (young gobblers) came out of nowhere and chased the big gobbler up the hill and out of sight, which gave me an idea of how he came about missing his tail feathers (turkeys do have a pecking order that can get nasty, and the jakes obviously had teamed up to give some payback). For the next hour I “purred” off and on with the Cherry Poppin Slate while Norma Jean performed an occasional twitch in the breeze. Suddenly I noticed a “snowball” in the brush on top of the hill and knew a gobbler was assessing Norma Jean, and then the snowball (which is how a gobbler’s head can appear in heavy cover) disappeared. I sensed he just might be circling in, from the right. Noon was just minutes away when I spotted the jealous hen coming fast down the hill, which was a dead giveaway I had a gobbler coming in. Suddenly a gobbler appeared broadside 20 yards away and was slowly approaching Norma Jean. As soon as the gobbler’s head and neck were just right I touched the trigger and the top barrel of my over and under 12 ga put the gobbler down for the count. The jealous hen of course, decided right away that Norma Jean could have the field all to herself. The gobbler turned out to be the one with a split-fan. High noon gobblers during the late season certainly work for me! I noticed orchard orioles in the woods on this hunt, so it is that time to make sure the oriole feeders are put out and waiting and humming birds will soon be arriving too. I also had a woods-wise friend call and tell me he found morels during the middle of the week (and of course he wouldn’t tell me where), so this weekend might be a good time to begin morel hunting.